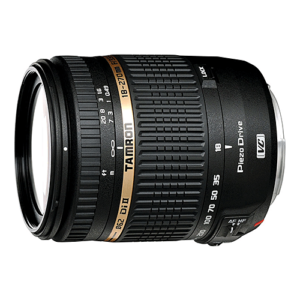 Lens Description: The acclaimed Tamron 18-270mm VC ultra zoom for APS-C format DSLRs has reached an astonishing new level of compactness, performance, and speed with the addition of PZD (Piezo Drive), an innovative ultrasonic autofocus motor based on an advanced piezoelectric design. The result is a lens that\'s considerably lighter, and noticeably shorter and slimmer (filter diameter: 62mm) than any previous lens in its class, and provides faster, quieter auto-focusing.Signature features that have made this amazingly versatile lens the world standard in its class have been retained. They include a 28-419mm equivalent (15X) zoom range, an improved, lightweight, compact Vibration Compensation (VC) system, macro focusing to 0.49m (19.3 inches) throughout, and, of course, superlative imaging performance. This lens is new to me. It seems to work fine, good light conditions. I am yet to try it in the shade, darker areas. A serious warning is not to MOVE the manual focus ring when in the AF position. It WILL, not may, damage the AF mechanism. I switch the lens back to MF after each set of photos. This may not be necessary but that way if you accidentally move the focus ring the lens will be OK.
Also, if your camera with this lens won’t shoot,take a picture, in AF but will in MF you need to change your camera settings. ISO as well as, one source recommended, shoot photos using the A (aperature) setting.